This visitation opportunity allows you to customize your individual needs for a campus visit. Simply contact our Admissions Office at least two weeks before your planned visit to set up your visit. Use the form below or call 507-354-8221 ext. 280 . Focus on Ministry Weekend is designed to give you a glimpse of what being a pastor, teacher, or staff minister is all about. You will also see what it is like to study for the public ministry. We’re sure that this weekend will help you in your decision of whether to try studying for the public ministry of the gospel. Maybe you’ll be surprised at what you hear. You’ll be able to experience campus life firsthand during your stay from Thursday night to Saturday morning. In the dorms and student center you will meet students who, just a few years ago, were facing the same questions and choices you are today. You’ll also meet professors, pastors, teachers, and staff ministers who want to help you in considering studying for public ministry. Meet pastors, teachers, and staff ministers and learn firsthand about ministry. Meet recent graduates from Wisconsin Lutheran Seminary who have finished their pastoral training and hear their perspective on the ministry. 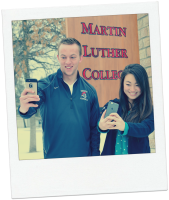 Meet students at Martin Luther College who are studying for the ministry as a pastor, teacher, or staff minister. Meet professors and get honest answers to your hard questions. Students who are currently in 10th to 12th grade and who wonder what it means to be a public servant of the gospel as a pastor, teacher, or staff minister. Students in the upper classes will receive priority consideration when we reach our enrollment cap for the weekend. Arrive Thursday evening by 5:00 in time for supper and chapel. Depart Saturday at noon. Pre-registration must occur two weeks before the Focus date. If you need a ride to and from Minneapolis-St. Paul Airport, we will arrange for that. Otherwise, we’ll assume that you will arrive here on your own. Can’t coordinate a visit to campus at this time? Visit our Virtual Tour to “walk” around campus locations.